Attikouris Medical is honoured to announce that our partners, Varian, have introduced the most advanced Proton Therapy machine for cancer treatment in Zurich, Switzerland. Varian is a world-leader in highly advanced cancer treatment technology. 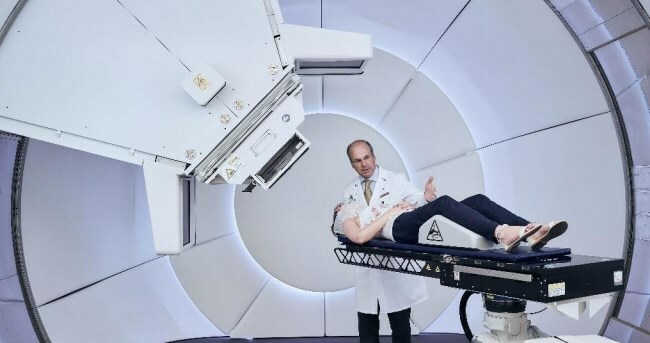 On May 15th, it launched a 270-tonne radiation therapy line at the Paul Scherrer Institute, which operates in conjunction with the University Hospital Zurich and the University of Zurich. Proton therapy is a highly advanced cancer treatment method. Each cancer patient receives an individual, personally tailored treatment plan. This can also include other forms of treatment, such as operations or chemotherapy, in addition to proton therapy. Proton therapy with the spot scanning technique means that a beam of positively charged atomic particles is fired at a tumour, and that the beam scans this tumour from back to front, layer by layer and row by row – until the proton beam has hit every spot on the tumour. Some types of cancer grow around sensitive structures in the body, such as the optic nerve for example, or have a very irregular form. If these tumours are treated with conventional radiation therapy, a much too large area has to be irradiated in order to really hit the whole tumour. It is precisely with these complicated tumours that the special advantage of proton therapy comes into play: Only with a proton beam can doctors control how deep in the body the particles should exert their maximum effect. Up to that point they do in fact penetrate other tissues, yet they do very limited damage there. The tissues behind the tumour remain unscathed. Consequently, there are fewer side-effects from proton irradiation than with conventional radiation therapy. To hit the tumour with the proton beam with one-millimetre precision, large and heavy technological equipment is required. The patient doesn’t notice much of this at the treatment facility, seeing only the patient couch in front of a white-clad wall. Its design resembles an oversized wheel and hides the actual gantry. A gantry is a rotatable beam guide mounted on a mechanical rotor. Nine primary magnets, which surround the vacuum pipe, steer the protons to the patient as a beam with up to one-millimetre accuracy. Next to the rotor, these magnets are responsible for the weight of Gantry 3. A weight of 220 tons – more than that of a blue whale – must be rotated during irradiation with a concentric precision of 50 micrometres. This is accomplished by two drive motors, just 10 horsepower each. Damien Weber, head and chairman of the proton therapy centre at PSI, stated that: With Gantry 3, we can offer highly effective proton therapy to more patients than ever before, because we have more capacity. That will be especially beneficial for children, for whom a conventional cancer irradiation would be too risky. With the proton therapy, we irradiate the tumour more accurately and better protect the healthy tissue around it. Attikouris Enterprises Director Costas Attikouris stated that: The advances in specialised cancer diagnosis and treatment are growing and improving rapidly. We are committed to providing the best equipment available in the world to our clients in Cyprus. The new National Health System in Cyprus, and the continual improvement of public and private clinics, show that Cyprus is serious about providing world-class healthcare. Together with Varian, we full support this process.